In a bowl mix together ground chicken, onion, parsley, cinnamon, 1 tsp cumin, 1 tsp coriander, cayenne, salt and pepper. Shape the mixture into 16 balls (make ahead and refrigerate for up to 2 days, or freeze. Thaw before using). Heat the oil and butter in a tagine or large deep skillet. Add the onion, garlic, ginger, and chili and sauté until they begin to brown. Add the turmeric, 1/2 tsp cumin, 1/2 tsp coriander, half the cilantro and mint, and the chicken broth. Bring to a boil, reduce heat, cover and simmer for 10 minutes. Carefully place the meatballs in the liquid. Try to do this in one layer. Cover and poach for about 15 minutes, rolling them in the liquid from time to time so they are cooked well on all sides. 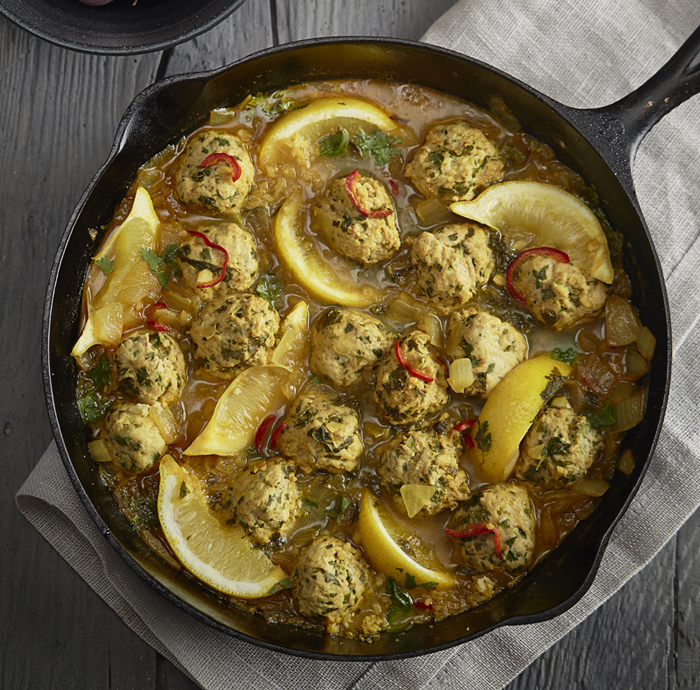 Pour lemon juice over meatballs, and tuck in the lemon wedges. Poach for another 10 minutes. Sprinkle with the remaining cilantro and mint and serve with couscous or rice.